The lure of the South was made during my Honours degree at RMIT University as part of an international exchange portfolio with the National College of Art and Design in Dublin. We did a large edition of 38 and the edition was swapped between all participants in the exchange portfolio. I have a beautiful set of prints from this folio. There were two requirements for this portfolio print, the first was that it had to be a final size of A4 (mine starts being A4 and opens up to reveal the creatures within). The second was that it related to the theme of North/ South. 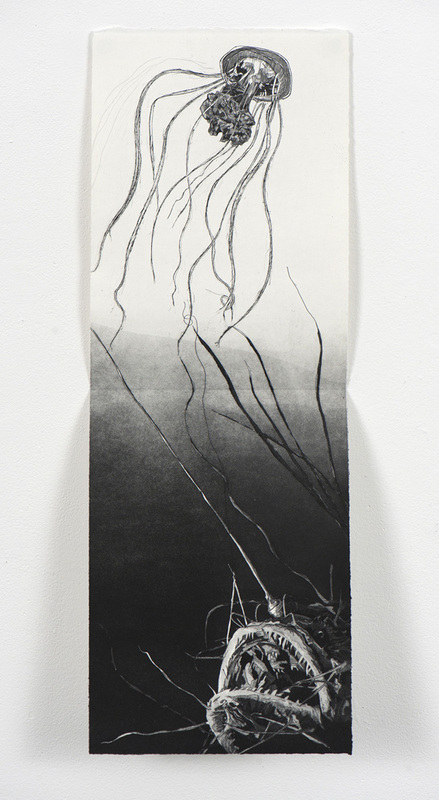 This print is an intaglio print on rag paper and its size is 59 x 21cm.